Director/Screenplay/Photography – Mark Atkins, Producer – David Michael Latt, Music – Christopher Cano, Visual Effects Supervisor – Joseph J. Lawson, Special Effects Supervisor – Carl Soto, Makeup – Antonia Henderson, Production Design – Reed Johns. Production Company – The Asylum. It is after the collapse of civilisation. A small handful of humans defend themselves each night from Nightwalkers, mutated former human creatures that feed on blood and shun the sunlight. One day, a man walks into the camp, although he has amnesia and no memory of his name or how he came to be there. It is believed that his blood may hold the possibility of creating an antibody against the Nightwalker infection. Facing dwindling supplies, the man leads them to where he believes they can find more ammunition. The Asylum is a low-budget US company that specialises in ‘mockbusters’ – cheap films that seek to capitalise on the publicity of upcoming big-budget releases with soundalike titles. Various Asylum films have included the likes of Snakes on a Train (2006), Transmorphers (2007), Allan Quatermain and the Temple of Skulls (2008), The Day the Earth Stopped (2008), The 18 Year Old Virgin (2009), Paranormal Entity (2009), Battle of Los Angeles (2011), Abraham Lincoln vs. Zombies (2012), Age of the Hobbits (2012), among others. 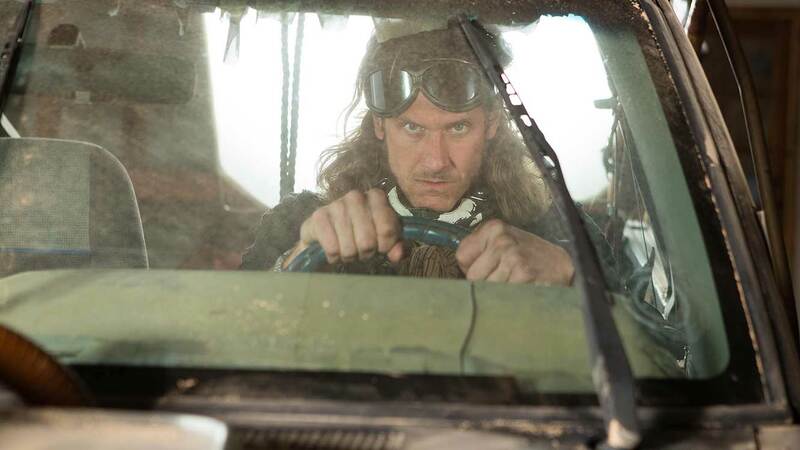 Road Wars was The Asylum’s response to Mad Max: Fury Road (2015) and was released to dvd ten days before its counterpart. It rehashes the same basics of a loner individual encountering a small community and engaged in furious races in customised vehicles against wasteland crazies in a post-holocaust setting. This film’s equivalent of Max (Cole Parker) even gets to drive a car that looks exactly like Max’s V8 Interceptor. The oddity of Road Wars is that it is a Max Max ripoff thrown together with vampires. It is essentially Mad Max meets I Am Legend (1954) – the original Richard Matheson book about the last man on Earth at siege from vampires, as opposed to the bastardised film versions The Omega Man (1971) or I Am Legend (2007). Road Wars is fairly typical fare for The Asylum. It has been made on the cheap. Where George Miller went to film in Namibia, this has merely been shot in the California desert. The action scenes are cut-price and the vehicular chases are routine, nothing that holds a patch on Miller’s incendiary action stunts. Road Warriors is not as bad film as some of The Asylum’s films are. It at least holds your attention for a certain way in and there are some okay performances from Chloe Farnworth and John Freeman. The only point I had difficulty following was the ending where [PLOT SPOILERS] Cole Parker is revealed to have been a Daywalker, a mutant vampire than can exist in the daylight. This seems a confusing explanation, especially given that Cole demonstrates no bloodlust anywhere throughout and seems as confused about the situation as the others are. It is also not exactly clear how he became one in the first place as all the flashback shows is his girlfriend biting him and I don’t see (or it is never specified) how this causes him to become a Daywalker. Director Mark Atkins is an Asylum regular was has also made Halloween Night (2006), Allan Quatermain and the Temple of Skulls (2008), Dragonquest (2009), The Haunting of Winchester House (2009), Princess of Mars (2009), Battle of Los Angeles (2011), Sand Sharks (2011), Alien Origin (2012), Jack the Giant Killer (2013), Knight of the Dead (2013), Android Cop (2014), Dragons of Camelot (2014), P-51 Dragon Fighter (2014), A Perfect Vacation (2015), Planet of the Sharks (2016), Empire of the Sharks (2017), Jurassic School (2017) and 6-Headed Shark Attack (2018).